The founding shareholders in Adam & Eve have collected an estimated £110m from the sale of their agency to Omnicom after completing a lucrative earn-out worth triple the amount they received initially. The five-year, uncapped earn-out hit close to £85m after Adam & Eve/DDB smashed financial targets, industry sources told Campaign's debut monthly print issue, which is published today. The earn-out windfall comes in addition to the £25.2m that Omnicom paid upfront in 2012 to buy Adam & Eve and merge it with DDB London. The four founding partners, James Murphy, David Golding, Ben Priest and Jon Forsyth (pictured above in 2012), owned just under 85% of the shares. Murphy and Golding each had 25%, making their individual stakes worth about £27.5m by the end of the earn-out. 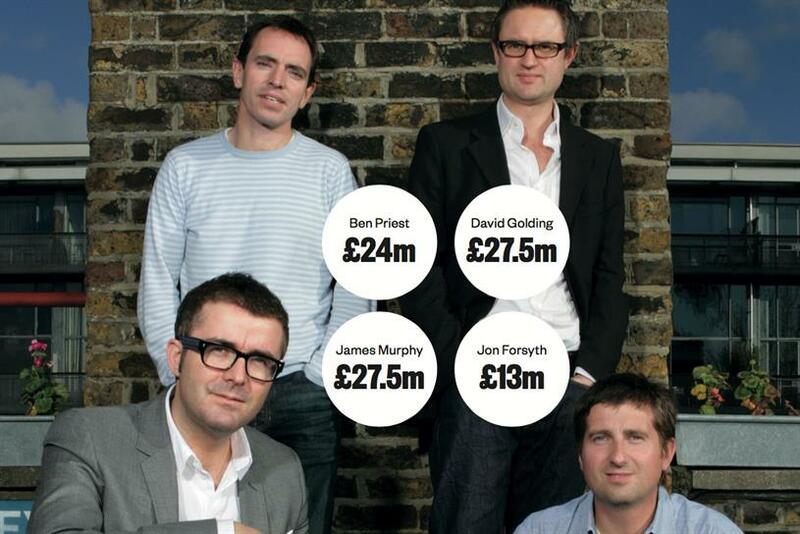 Priest had about 22%, worth around £24m, and Forsyth about 12%, worth around £13m. Other staff held the rest of the shares. The scale of the earn-out makes the agency one of the most financially successful, creative UK start-ups of the past decade. It is thought that the earn-out was based on Adam & Eve/DDB’s revenue and profit growth from 2012 to 2016 but the final amount was approved only this summer. Accounts for DDB Europe, a UK-based holding company, show how the "liability" – the amount that was due to be paid to Adam & Eve’s shareholders by the end of the earn-out – kept rising. The 2012 accounts show DDB Europe paid £25.2m for Adam & Eve, with a further liability of £17.6m due in 2017 "subject to the performance of the company". That liability had trebled by the end of 2015 to £50.1m. It rose by £159,000 in the 2013 accounts, by another £8.4m in the 2014 accounts and a further £22.7m in the 2015 accounts. DDB Europe has not yet filed 2016 accounts but Campaign estimates the earn-out "liability" leapt by as much as £35m in the final 12 months to reach in the region of £85m by the end of last year as the agency kept growing. It has been an open secret in the ad industry that the earn-out was uncapped but a total payout of around £110m is far higher than most industry observers expected. When Adam & Eve was sold in 2012, Campaign estimated at the time that the deal could value the agency at £60m by the end of the earn-out. Corporate advisory firm Clarity, lawyers Osborne Clark and accountants Kingston Smith advised Adam & Eve’s shareholders on the sale. The agency was already known for its Christmas ads for John Lewis and kept growing after 2012, winning more clients such as Lloyds Banking Group, Waitrose and Virgin Atlantic and picking up awards, including Global Ad Agency of the Year at Cannes Lions in 2014 and Agency of the Year in the Campaign Annual in 2014, 2015 and 2016. Adam & Eve/DDB extended its reach to the US by winning Samsung’s account in North America in autumn 2016 before the end of the earn-out. Murphy, Golding and Priest have agreed to stay at Adam & Eve/DDB after their earn-out completed but Forsyth departed. Adam & Eve was making an annual profit of about £3m in 2012 when it was bought for £25.2m – a profit multiple of around eight times, which is typical for an acquisition in marketing services. A total payout of £110m would equate to 36 times annual profits at the time of the original deal. Adam & Eve/DDB is now likely to be making an annual profit of at least £12.5m – the figure that was reported in the most recent, published accounts for DDB UK in 2015. On that basis, a £110m valuation could be equivalent to a multiple of 8.8 times current profits.